What type of entity you should establish? What financing will you need, and where will it come from? What should you expect in terms of taxes? What do you need to do for bookkeeping and payroll? The decisions you make when it comes to your accounting will have a major impact on the success or failure of your new business venture. That’s why we encourage you to start things off by getting sound business and accounting advice from someone that not only knows small business, but that’s taken the time to get to know your business. We start by getting to know the issues and problems you’ll face and the goals you want to achieve. With this deep understanding of your business, we’re able to customize unique accounting packages that are formulated specifically to meet your needs. As a small business owner just starting off, it’s essential that you make smart decisions about where you spend your money. One of the things makes us unique at The Harding Group is our ability to provide top-quality bookkeeping services at affordable rates. Unlike many CPA firms, we have bookkeepers on staff, so we’re capable of providing bookkeeping and payroll services without outsourcing it or charging full CPA rates. This is just one of many ways we can help you make smart financial decisions that could be critical to the success or failure of your new business venture. We strongly encourage you to meet with us for a free initial consultation so we can help answer your questions, pose other questions for you to think about, and help ensure you’re off to a good start. Dan’s other company (a technology firm) has been a THG client for years. 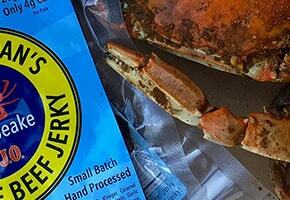 But we love that Dan is following his heart and also pursuing something completely different – gourmet beef jerky. We’re happy to be part of the team as he breaks into the national market!